To Your Health: 45) SEA SALT VS ROCK SALT VS TABLE SALT. WHICH IS HEALTHIER? In this instance, salt is the subject open for debate. It is up to you, dear readers to make your own deductions about the information that I am about to share with you. The majority designer salts which include sea salt and rock salt are, like plain salt, mostly sodium chloride. 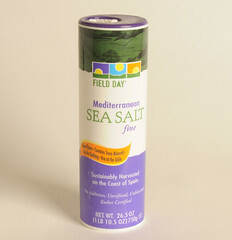 Sea salt is a favorite with gourmet cooks and are found in supermarkets, restaurants and your favorite food shows. TV chefs tells you to season, season, season but public experts tells you not to add salt at all. So is sea salt healthy? According to Professor Bruce Neal, chair of the Australian Division of World Action on Salt says that Sea Salt are fancy salts that are just a more expensive way of doing yourself harm. So the answer is a resounding "No". His argument is that 40 percent of the salt is sodium and it is sodium that raises your blood pressure which is a major risk factor for heart attacks and strokes. He claims he has evidence for this and it is as iron clad as the evidence for the adverse effects of tobacco. Why give different names to salt? Chemically similar, the various salts are made differently. Sea salt which is also known as solar salt, is produced by evaporating seawater and harvesting the salt that is left behind. Table salt is processed by refining sea salt to purify the sodium chloride. Rock Salt is also refined to make table salt. The difference is that rock salt is mined from inland deposits that are the remains of ancient lakes or seas. No matter what method the salt was produced, it has no effect on our health when we eat these salts. Professor Neal also states that the only 'healthier salts' are salt substitutes that are lower in sodium as they contain a mixture of sodium chloride and potassium chloride and for taste, a little magnesium chloride is added. Furthermore, the potassium in potassium chloride can help lower blood pressure in its own right. However, he advised that it is better to get your potassium in fresh fruit and vegetables and it is one of the reasons they are so good for you. Since sea salt, like table salt, is essentially sodium chloride (a chemical) it is untrue to describe it as "chemical free". The most harmful chemical in table salt is the same as in sea salt: sodium chloride. While it's generally true that unprocessed foods are much better for you, it's not in this case. Sea salt, in spite of its raw state, still raises your blood pressure. sea salt or table salt, it does not make any difference. Even onion, celery and garlic salt are also high in sodium and are no better. However, Professor Neal acknowledged that if anything, sea salts generally coarser texture means it could be said to be less healthy. 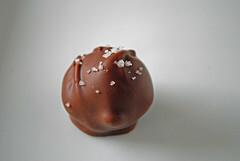 Coarse ground salt or flakes don't taste as salty on the tongue as finer particles, because of the lower surface area. So you need more salt to get the same "hit". But it is the texture rather than how the salt is made that makes the difference. In reality, we need only about one gram of salt a day, an amount that is so minute, we could meet our daily needs almost completely from the salt that occurs naturally in foods. Even processed foods like bread, cheese and margarine will easily push our salt intake over this level. Therefore, we definitly do not need added salt as well. Our tastebuds have been conditioned by our love for hawker food, fast food and snacks that it is working against us in the modern world. So if you cannot give up the taste of a particular salt, pink or grey, flaked or ground, be very sparing. "Our message is not to ban salt," says Professor Neal. "But people need to think about it, and use other herbs and spices to season where they can." Professor Bruce Neal is also Chair of Vascular Epidermiology and Prevention Medicine, The George Institute for Global Health. We will now continue with the debate from the opposing medical expert, Dr Joseph A. Anthony. This is from an email send by a friend for sharing with you. Consultant: St.Philomena's Hospital, Florida, USA. Former Professor: St.John's Medical College, California, USA. Former Medical Director: St.Philomena's Hospital, Florida, USA. Now that that you have heard the opinions from both medical experts on , it is up to you to decide which recommendations you want to follow. My next topic for discussion is, "Do It Yourself Facial Massage." I have also found a website that shows you how to make herb salt. Click on this link to find out more. How to make herb salt. This is one of my earliest drawings. An attempt to draw ice and glass effect. Hope you like it. Is Salt Good For Your Weight Training And Muscle Building? You are welcome Vira International.